The new stamps from the Finland postal service are gay. Like really gay. Like overtly gay. And that's the point. 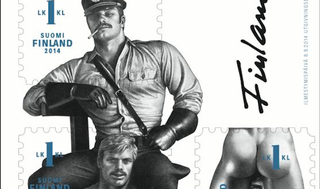 The new stamps feature artwork from Tom of Finland, an artist known for the in-your-face homoeroticism of his illustrations. Touko Laaksonen, as Tom of Finland was actually known, was alive from 1920 to 1991. He served in World War II as a second lieutenant and his military background served as inspiration for his work. Especially, as can be readily apparent in his illustrations, the uniforms of the various fascist groups in Europe, including the Nazis. In my drawings I have no political statements to make, no ideology. I am thinking only about the picture itself. The whole Nazi philosophy, the racism and all that, is hateful to me, but of course I drew them anyway—they had the sexiest uniforms! Laaksonen's work continues to be pretty controversial, many thinking it is simply pornographic. However, examples of his work exist in several collections, including major museum collections. It certainly isn't easily ignored. Especially not when it's on a letter.... or a, huh huh, "package" (yes, I'm 12, and never you mind). See Itella's (the Finn postal service) press release here.